Being homeowners, we do our best to do all we can to keep it in shape, but with 6 kids…um, need we say more? We really didn’t pay attention to our roof unless the wind was blowing too hard or the kids lost the baseball or Frisbee up there… again! Our neighbor informed us that he had to take care of some damage to his home because his roof was leaking, and… then… kindly mentioned that the reason was because the tree in our yard was the cause. Oops! This got us thinking, because our homes were not only next to each other, but built at the exact same time, by the same builder, and our roofs were put on at the same time. His roof was damaged and ours … gulp… ours was next! So we thought! So, we start doing some independent research of replacing our roof because it’s well over 15 years old and it looks TERRIBLE. Black streaks, big green clumps of moss, and it wasn’t just on the North side of my house. Our whole roof was dirty. Especially in the shaded parts under the protective canopy of my fruitless mulberry. Once we figured out that our shingles were the Asphalt type, we began looking for the best way to clean them. The three different types of trees on the West side of our house dropped leaves, flowers, plums, and branches creating a thick coating of its own insulation that would make any pack rat want to leave the shed and move up to the penthouse. Thus, the neighbors complaint. Now, Sacramento is known as the “City of Trees” and normally leaves and branches can land on any rooftop. We figured most homes that have moss or algae are near the coastal regions, such as the Bay Area, or near large bodies of water, and they are! After more research, we found that our home was NOT the only one that had this problem. 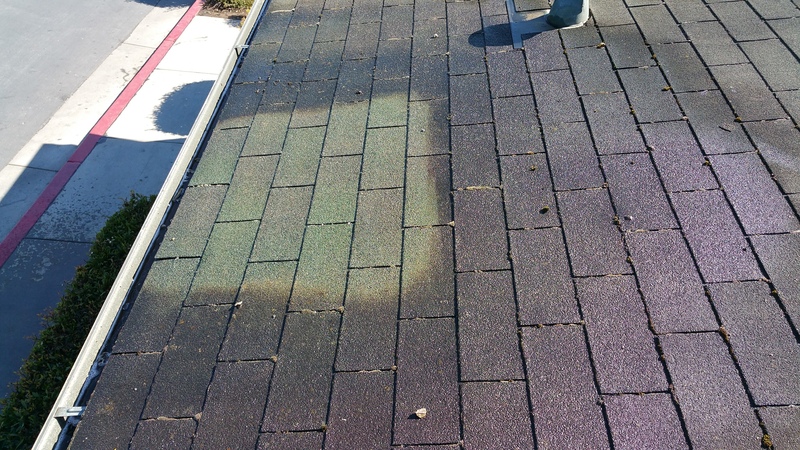 The ENTIRE Sacramento Region, even though we experience little to no rain in the Summer, still has these black or mustard color stains with little white flower thingies intermixed on their roofs. According to Asphaltroofing.org Organic-based asphalt shingles are manufactured with a base (also termed mat or substrate) made of various cellulose fibers, such as recycled waste paper and wood fibers. This organic base is then saturated with a specially formulated asphalt coating and surfaced with weather resistant mineral granules. Organic based… hmm…. what does this mean? What does that have to do with our roof getting dirty. Well, like a pig goes to the mud, the little bacteria spore that is floating around the world from the foundations of time, loves to EAT YOUR ROOF SHINGLES! That’s right… our shingles were being eaten alive! We began our funeral preparations. Over time, Gloeocapsa magma breaks down the shingles by feeding off of the limestone granules embedded in the shingles. This decreases a roof’s ability to reflect ultra-violet rays of light and shortens the life of the roof. “Once the bacteria have become noticeable, the stains will continue to worsen year to year. As the bacterial colony grows, gravity pulls it downward, resulting in the smear-like stain down roofs. Most “experts” within the subject area conclude the bacteria to be harmful, if left untreated, as the growth holds moisture within shingles causing premature aging, rotting, and/or granule loss. What to do? What to do? for Heaven’s sake! We wanted our roof, not only free from this ugly bacteria, but sound and affordable, also. GSW Logo … just kidding! (We did have some shingles that needed repaired and/or replaced for the record) Remember the fruitless mulberry tree? Power Wash(PW)… right? WRONG! Especially not on an Asphalt roof. Power Washing may damage or dislodge the loose “organic granules” already on their last legs and ready to find it final resting place down the roof, into the gutter, and then meet the “itsy-bitsy spider” in the downspout. I then found that EVERY roof type, whether Asphalt Shingle, Wood or Shake Shingle , Metal Shingle, Slate Shingle, or Tile Shingle all have something in common, other than keeping rain out of your home... it will have GM growing on it and slowly destroying the beauty, life expectancy, and UV functionality of your roof. It has to be eradicated or remove the shingles… either or! Back to PW. In some cases, PW will be used to clean tile, concrete, and metal shingles, but it only gives the shingle an “HAIRCUT”. It buzzes the top off, removes the top layer, but doesn’t always kill the root of the bacteria growing on the shingle. High pressure force feeds the water into the nooks and crannies of the shingle and actually “FEEDS” the plant the precious nutrient of WATER. So, we’ve found out that, in this CA Drought, that the Moss, Lichen, Algae, and GM like the DELTA SMELT, laying dormant in the hot Northern Californian Climate, only to awaken and emerge victorious with the first precious droplet of the dew from HEAVEN… or something like that. PW also uses High Pressure (1500-3500 PSI), a lot of water (like 7-9 gallons per minute) and the only way to clean the roof is to walk on it that may cause damage to the roof. This method is usually inexpensive, temporarily effective with immediate results, but plan on paying next year to schedule another “Haircut”. PW near lakes and streams are recommended by not always the best choice because of the reasons above. Don’t get me wrong, PW is the only option in some cases, but education gets the best results. We considered (DIY) doing it ourselves with the products from the big box stores… Um.. the commercials for this stuff are great, but figuring out which is best for you, what are the active ingredients, is the mix correct, AND how will it affect my plants, animals, kids, deck, fence and lawn furniture that now is rusty and staining my back patio? Stick to the Professional! We learned the hard way! We’ll miss that rose bush! SW only uses between NINE to FORTY PSI. This Non-Pressure application reduces destruction to the shingle and completely eradicates the bacteria. The formula of “Electrified” Salt Water (SH), Amine Salts and Soaps penetrates the “hiding spots” of the GM and Bacteria killing it on contact and even preventing it from growing back for years to come. As a precaution and reassurance to the homeowner, the SW technician will make sure that all plants, shrubs, and trees are well watered or protected from the PH balanced solution by the time it safely meets the spiders in the downspout. So, that’s our story. We learned a lot about our home, our city and community as a whole. We found out that Sacramento homes are infested with this GM cyanobacteria that will enventually do more harm than good to a homeowners pocketbook in the long run. We’d like to help educate others of what needs to be done to revitalize their roof and bring it back to like new status. We know eventually, we will have to repair or add another layer of shingles but, we never did have the Funeral for our Roof. We never tore it off or replaced it, but because we did a little research, we only spent a few hundred dollars instead of a few thousand. Restore or Remove? Educate yourself, like we did and we chose to Restore!